Notes: Each capsule contains: Potassium 20 mg. Read all warnings and directions before use. Keep carton. Recommended Use: Do not take more than directed. The smallest effective dose should be used. Adults and children 12 years and over: take 1 capsule every 4 to 6 hours while symptoms persist. If pain or fever does not respond to 1 capsule, 2 capsules may be used. Do not exceed 6 capsules in 24 hours, unless directed by a doctor. Children under 12 years: ask a doctor. 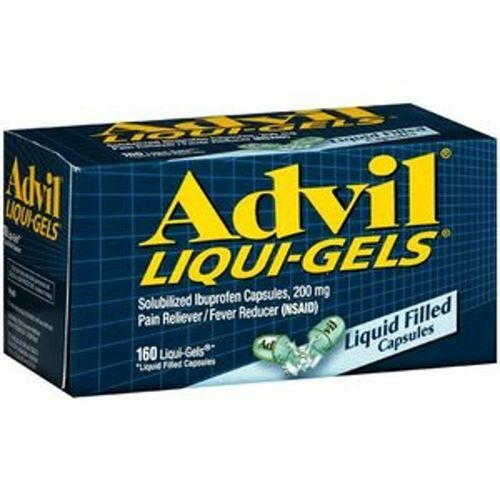 The customer reviews posted below are based on individual consumer experiences and may NOT necessarily represent what expected results will be from using or taking Advil Pain Reliever and Fever Reducer - 160 Liqui-Gels. These results may not be typical and you should not necessarily expect to receive the same results. Actual results may vary. Happy with the purchase, I will repeat. It is the only medication that works for my partner for headache, he arrived in Spain in less than 15 days, I recommend his purchase to anyone who likes this product. I backed out that he was sent from the USA because of the fear of they could stop it at customs or something like that, but there was no problem, I got there a lot sooner than I thought it would, I did not find it better on another website, I'll probably go back and make another purchase on the web when I finish. Advil acts quickly. Between 15 to 20 minutes, the pain goes away.